Become a member of the Seamus family Founder's Club - receive exclusive, pre-release access to our small-lot, handcrafted wines at 20% off year-round. 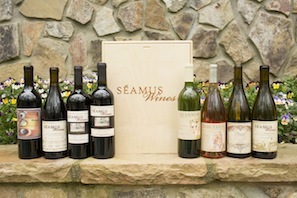 In addition, your Founder’s Club discount applies in the Seamus Wines Tasting Lounge. Wine Club Members receive complimentary tastings for up to 4 guests in addition to enjoying a 20% discount on all purchases. At least 3 bottles of classic/reserve wines per shipment - guaranteed! Planned shipments will typically cost $240 - $265. Each shipment will include at least 3 limited-production Classic or Reserve wines, which are guaranteed. In addition to the guaranteed Classics/Reserves, you'll also have the opportunity to log into your online account and change the other 3 bottles if you wish, to whatever wines you want.